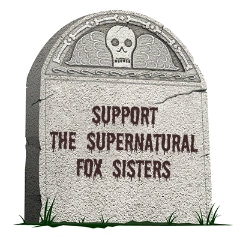 Thank you for visiting the Supernatural Fox Sisters store! Get a little something for yourself or a friend while supporting the site. We are working hard to create new products our readers might enjoy in the spooky/supernatural vein—more items coming soon! If you’d like to contribute to the site without making a store purchase, visit our "About" page for more options, and for exclusive pledge/donation gifts unavailable for sale. Support from our readers helps us keep the posts coming, and makes us happy! Win-win!